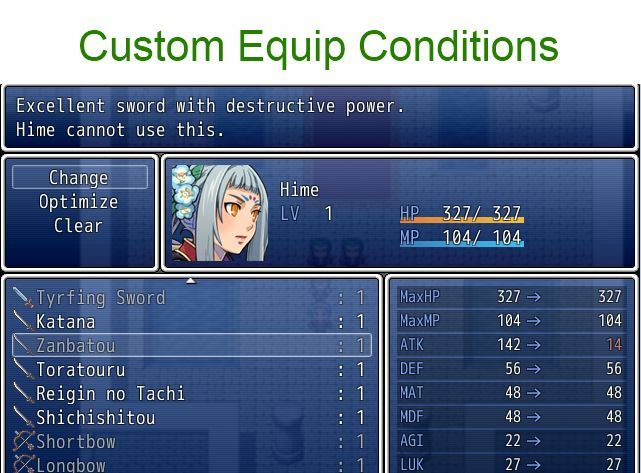 This script allows you to specify custom equip conditions for your equips. In addition to the default equip conditions such as armor type and weapon type, all custom equip conditions must be met in order for the actor to wear the equip. The condition uses a formula, so it can be based on almost anything. home. “Well, this can be hilarious, the thing is, there exists a far-left leaning former high-ranking bureaucrat investigating a much further far-left administration. * Dimethylaminoethanol DMAE is related to choline which is a biochemical precursor on the neurotransmitter acetylcholine. I’m sorry for bother you, but I can’t find how to write the formula for the actor ID. Im trying to make a Armor only equippable for actor 14, 15, and 16 (example), but I cant make it work, how it would be the formula for that? a.id == 14 doesn’t work. Your initial formula should allow actor 14 to wear the equip. Yes, I made a stupid mistake regarding the armor type but I figured it out lol. But i didn’t know about the “||” part, that helps me a lot. Again, thank you very much! Love your Scripts! You make a awesome work! I’m finding this script really useful, thanks. Was wondering though – if an object is already equipped, and then a state is inflicted that lowers a parameter / changes one of the equip conditions….what happens? Will the game still treat the object as being equipped, and carry all its inherent bonuses? Say this happens in battle but the inflicted state remains afterwards, will it still show the object as being equipped? If I then unequip it and then try to re-equip will it no longer show up since I am now not meeting the equip condition? Thanks in advance. The equip SHOULD be removed once the equip condition is no longer met. When a state is applied, it refreshes the battler, and during this process equips will be checked. Thanks~! Though I came across a weird effect, and I’m unsure if it’s supposed to do this or not; when I obtain the armor before having the defense points required to equip it, it doesn’t show up in my inventory at all. (I thought it would be present but grayed out.) When I get the defense points, it appears. Default scripts have it so that if you can’t equip something, it doesn’t even appear. I’m assuming this is so that if you had 20 different types of weapons, and you could only equip swords, you don’t see the other 19 types. Hey there, Hime! I just had a quick question; could you give an example of how a formula should look to be used for this script? I’m currently trying to have an armor equip only if the player’s defense is over fifty. I can only find battle formulas so far online, lol!